Sungha Jung visited our shore recently on 12th July 2014 for Sungha Jung 2014 Live In KL with the help of Wind Strings Entertainment as the showcase was held at Bentley Music Auditorium, Mutiara Damansara.For those who do not know, this South Korean lad is talented and famous for his guitar-plucking skill! Swarm of people were seen outside the hall as early as 12PM to catch a glimpse of the lad, rehearsing on the stage! Sungha Jung’s albums were also sold outside the hall for fans to purchase for the autograph session after the showcase ends. Photo session with Sungha Jung for VIP ticket holders was also held outside the hall right before the door opens. The sold-out showcase kicked off with featuring guest, Agustin Amigo performed for the opening a few songs. The man of the day then appeared, receiving thunderous applause from the audience as he, without further ado, performed two songs from his albums and ended the first set of the showcase with a song from ‘Monoloque’ before a 15-minutes break. Second set started as Sungha Jung performed a cover of John Mayer’s song. Surprisingly, he showcased the audience his soothing voice as well! He then continued to perform a few more songs including a cover of ‘Let It Go’ from the popular Disney animation movie, ‘Frozen’, Big Bang’s Taeyang’s ‘Eyes, Nose, Lips’& Michael Jackson’s ‘Thriller’ with an eerie intro that creeps the audience with goosebumps! 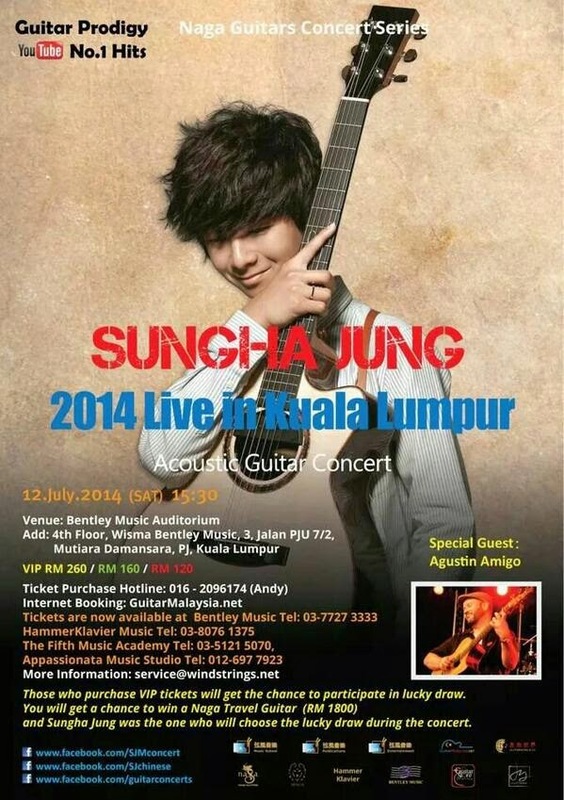 As for the encore, Sungha Jung collaborated with Agustin Amigo for a performance, accompanied with claps from audience. It was then time for a lucky draw as Sungha Jung drew a seat number and a lucky fan merged as she received an acoustic guitar from Sungha Jung himself! The showcase then wrapped up with an autograph session. KloseUP would like to thank Wind Strings Entertainment for this golden opportunity to cover this splendid event.